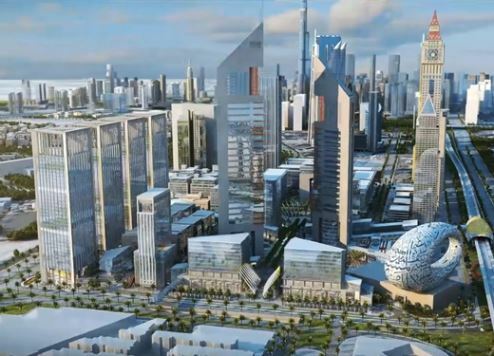 Sheikh Mohammed bin Rashid Al Maktoum, Vice President and Prime Minister of the UAE and Ruler of Dubai, has revealed plans to build a new $1.36 billion business district. The Emirates Towers Business Park project is located between Sheikh Zayed Road and Happiness Street close to Dubai International Financial Centre (DIFC), according to state news agency WAM. When completed, the development will become an integrated business precinct in the heart of Dubai’s financial district and will provide a legislative environment with international standards of governance and transparency under the regulations of the DIFC Authority. The project has been considered in response to the increasing demand from international corporations looking to establish a presence in Dubai’s thriving economy. WAM said the Emirates Towers Business Park would meet increasing demand for Grade A office space through high- and low-rise office towers, catering to a range of corporate requirements. The development will also include three five-star hotels. The Jumeirah Group will manage one of those, while the other two will be operated by other well-known international hospitality groups, WAM added. The news comes just weeks after plans to build Dubai’s first French Riveria-inspired neighbourhood were unveiled. More than US$1.36bn is being invested in the Azizi Riviera project, which will be located alongside the new Dubai Canal waterfront and is part of Meydan One in Mohammed Bin Rashid Al Maktoum City (MBR City). In addition to residential accommodation, the new suburb will feature its own retail district, which will include the Meydan One mall, due to open in 2020 with 620 outlets, as well as two hotels – one five-star, one four-star. The community will also feature walking paths, water transport, yachting facilities and a marina.